I am appealing to the hungry man's heart with this recipe. I have the hardest time trying to feed infantrymen with cooking that they will eat. Go figure they hate veggies!! I added broccoli as an option to throw into the pot if you have veggie lovers in your home. This recipe is really easy and will actually flavor itself!! Let your GSO or sun oven get to about 300 degrees before you put it in. 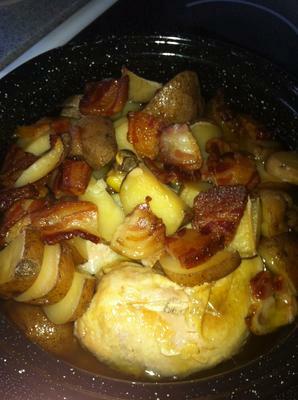 This meal goes on the crock pot method and will take a good portion of the day to cook. let it do its thing for a few hours. I left mine in for 5 hours and turned (focused) and checked as needed. when you can puncture the chicken with a fork and it wants to fall off the bone, you are in business! sprinkle with some cheddar cheese and let it sit for a few minutes before serving. No spices are needed. This recipe tastes great without it, and men LOVE bacon. Win! Thanks for another great, and simple solar cooker recipe! Yes, guys do like bacon, but then again my 18 year old daughter loves bacon too...all of my kids do.